It is our villages that sustain us by providing those who live in cities with the nourishment needed in order to survive. However, today, we are just exploiting villages and casting them aside. It is time to acknowledge that our villages are our very foundation and move forward with one heart and one mind to protect and serve them. Born in 1994 in a village in Gujarat, Seema Ben was the eldest of 5 children, 2 boys and 3 girls. As a child, she lived with her grandmother and excelled in sports such as Football and Cricket. Although she lived less with her parents than her grandparents, she felt very supported by them, for “when in need, they would come immediately.” Their two goals for her were a good job and marriage. But Seema relates that it was her mother’s sister who had the greatest influence on her life. “My aunty guided me through difficulties. She also encouraged me, sometimes even forcing me to study and do well in school. “Friends” were another influencing force. Traveling to school together, everything was shared. “We even ate from the same plate,” Seema recalls. The greatest hardship of her youth came only after she graduated from high school and married a man from her village. Before she even moved into his family’s home, she already knew that she could not spend her life with him. 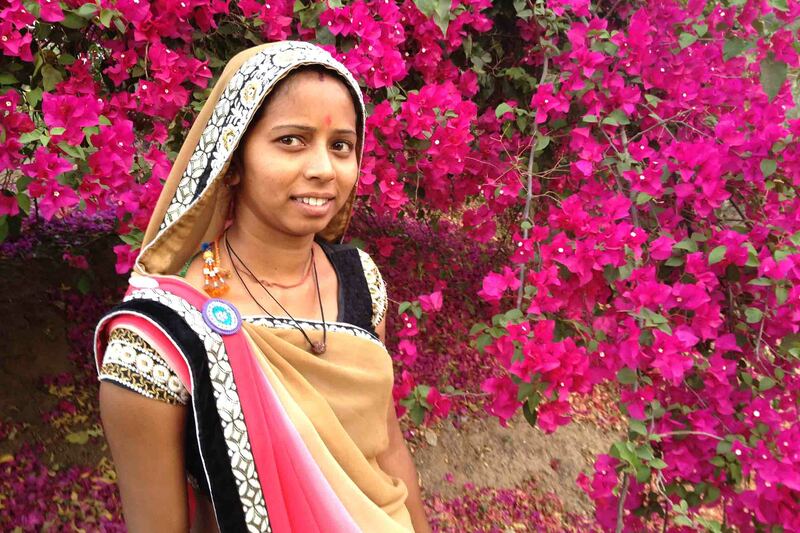 Divorce is very rare in Indian villages, but Seema’s parents eventually gave their permission. Having been divorced before even moving out of her parents house may have been a setback for many young girls just entering their adult years, but not for Seema. Unbeknownst to her, her second marriage in 2014 and subsequent move to the village of Nani Borvai, 70 kilometers outside the capital city of Ahmedabad, would propel her life forward into one of leadership and proactive change. With its close ties to nature, pumped-in water, children running through fields of green and edible plants while their mothers and fathers work long days in the fields, life in Nani Borvai was not so different from the village she had grown up in. After she and Kiran were married, Seema moved in with his family, as is customary, and assumed a portion of the cooking and housekeeping responsibilities for his parents and siblings. All of this was satisfactory, but Seema wanted something more. From deep inside, she desired a job that would enable her to use her education to earn some money. So when the Amrita SeRVe director came to recruit several health workers who would be trained at AIMS hospital in Kochi, she leaped at the opportunity. The extensive training at AIMS expanded Seema’s education, developing new skills and abilities. Not only did she gain knowledge in preventing infections and diseases, but she was also trained in public speaking and shown how to perform role plays to teach villagers how to cope with problems such as diarrhea and alcohol usage. Upon returning to Nani Borvai, she began working together with the village coordinator appointed by Amrita SeRVe, making house calls and getting to know the villagers. Applying her new public speaking skills, she coordinated and spoke at meetings, surveyed the village, and together with the village coordinator met the locals in hospitals and government offices. As a result, Seema began making important connections. Her outstanding performance as a health worker did not go unnoticed, and when the village coordinator left, the Amrita SeRVe director asked if she would like to take over. By this time, Seema was well prepared and welcomed this step up, including the pay increase, which her family was happy about, too. Her first action was to establish a village development committee to discuss and find solutions to various problems. She also re-started and revitalized the farmers’ group. Working with all men, she called for the meetings and informed them about government schemes, which provide money and training at little or no cost. But the project she was most excited about were the AmritaSREE Self-Help Groups (SHG’s), which she felt would solve many problems. Founded by Amma in 2005, a year after the Tsunami and following a spate of farmer suicides, these groups are based on the training of women to shift them from dependence to self-reliance, building trust and confidence between members. Over a short period of time, Seema helped establish 12 SHG’s for women in Nani Borvai. Enthused by their accomplishments, the SHG women began thinking about creating an income generating enterprise. Seema consulted Sreeni, the Amrita SeRVe agricultural program manager, about possible enterprises. “Well—you sure have a lot of buffaloes and cows here!” he observed. In fact, over 300 buffaloes and 75 cows resided in the village alongside 671 people. Indeed, milk—especially Buffalo milk, which sells for a higher price due to the higher fat content, seemed to be the most lucrative commodity. However, long before the SHG’s were formed, the village women had already put in a lot of time and energy trying to make money selling milk. The women had even struggled for years trying to open a milk collection unit in the village. Lacking government connections and not knowing whom to approach, they did not succeed. Now, however, empowered by their success in availing themselves of government schemes, and with Seema and Amrita Serve’s program manager, Sreeni, paving the way, the SHG women had a renewed sense of confidence. In fact, plans for the milk collection center began moving ahead in 2018, the very day Sreeni arranged a meeting with Amul Dairy in Ahmedabad. A delegation from Nani Borvai visited Amul Dairy and had a successful discussion with managing director M.R.R.S. Sodhi. Additional meetings and visits followed. In August 2018, an Amul representative came to Nani Borvai to meet with the villagers. During the period of negotiations, Seema and AMMACHI Labs zonal coordinator Praveen Parmar continuously encouraged and inspired the women to get involved in this endeavor. Rising to the challenge, the SHG women met with the director, who asked them to submit the documents. In September, a joint bank account was set up, and in October, a house not far from Seema’s was prepared as a collection center. A huge inauguration program was held in the village. The director, members of the Legislative Assembly, and district level officers attended, too. The entire village participated. With the village women generating an income for the first time, Seema sees many positive outcomes such as money for education and medical needs. The additional household income will also provide a buffer for their farmer husbands, whose farm produce is dependent upon the monsoons coming at the right time and for the right amount of time.